Tired of beginner's books? This problem-solver is for the experienced researcher who has already done the easy part. in a difficult time period. 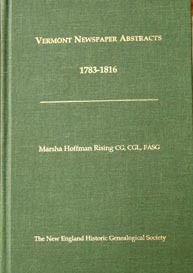 All items of genealogical interest for western Vermont from the first newspapers in the area. In this, her last book, Rising traces the descendants of Nathan Brown through five generations. 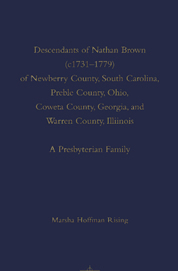 The introductory text shows the author’s characteristic ability to set the genealogical information in context: “The Nathan Brown family was part of the great wave that rolled from Ulster to America during the second and third quarters of the eighteenth century. By the time the family reached its decision to emigrate, one-third or so of the entire Protestant population of Ireland had left. By the outbreak of the American Revolution (four years after their arrival), the estimated half-million Ulster Scots in America comprised one-sixth of the colonial population. There can be no question that these people of similar ethnicity, customs, religion, and political principles made an extensive impact on the communities in which they settled.” 6 x 9, hardcover, 516 pages, illustrations, index. $49.95. �Accumulating Negative Evidence,� APG Quarterly IV (Fall 1989): 66-68. A Maze of Halls in Taunton, Massachusetts: Correlating Land Descriptions to Prove Identity� National Genealogical Society Quarterly. 81 (March 1993): 19-23. �Audience Survey of Genealogy Workshops,� Association for Professional Genealogists Quarterly 4 (Winter 1986): 29-32. �Computers and Genealogical Scholarship: Have the Twain Yet Met?� National Genealogical Society Quarterly 76(September 1988): 225-229. �David Robinson (1704-1793) of Watertown, Newton, Needham, Weston, Natick and Marlborough, Mass. Where Does He Belong?� The American Genealogist67 (July 1992): 136-142. 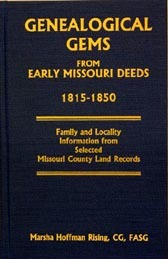 "Deeds Hold Clues: Finding Lewis H. Walton of Southwest Missouri," NGS NewsMagazine 30 (June/July 2004): 52-55. �Forging Links in a Surveyor's Chain: Samuel M. Scroggins of Missouri and Tennessee,� National Genealogical Society Quarterly 83 (December 1995): 268�276. �Genealogical Research by Correspondence,� NGS Newsletter 15 (No. 5) 1989. �Genetic Abnormality at Thorpe?� Genealogical Journal 17(1988-1989): 5-7. �Graduates from Monmouth College 1858-1876� Illinois State Genealogical Society Quarterly, 15 (Winter 1983): 236-245 and �Graduates from Monmouth College 1877-188911� Illinois State Genealogical Society Quarterly 18: (Fall 1986) 129-139. �Looking Backward,� NGS Newsletter 16 (No. 3 1990) 1-3. �New York Marriages in Bennington, Vermont 1809-1828,� New York Genealogical and Biographical Record 116 (April 1985): 92-93. 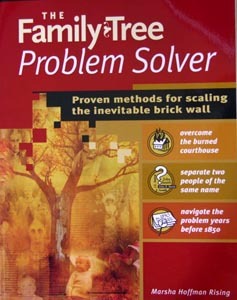 �Problematic Parents and Potential Offspring: The Example of Nathan Brown,� National Genealogical Society Quarterly. 79 (June 1991) 85-99. This article received the NGS Award of Excellence in 1992. �Professional vs. Hobbyist,� Association of Professional Genealogists Quarterly 4(Spring 1989) reprinted from November 1985. �Promises to Keep: The Professionals Look at Adoption Research,� APGQ. VI (Fall 1991)62-65. 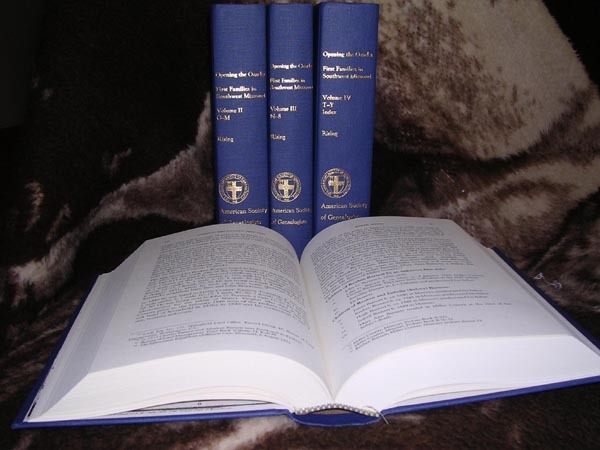 "The Difficult Life of Dorothy (Rawlinson) Talby (1598-1638) of Salem, Massachusetts,� The American Genealogist 78 (January 2003):1�8 (with Robert C. Anderson). �The Gash Family of Buncombe County, North Carolina�Who Was Ebenezer Gash of St. Clair County, Missouri?� The American Genealogist 73 (April 1998): 105�116. �The Rountree Family of Maury County, Tennessee,� Ozar�kin 24 (Fall 2003): 97�101. �The Search for Mary Ann Spangler: Narrowing a Field of Potential Parents,� National Genealogical Society Quarterly 77 (September 1989): 197-207. �Three William Uphams of Newton, Massachusetts,� The American Genealogist 63 (October 1988): 216-222. �Trousers for Elijah: The Probable Identity of Elijah Robinson of Conewango Twp., Cattaraugus Co. NY,� The American Genealogist 63 (April 1988): 82-90. �When the Primary Sources are Wrong�Or, Who Was the Wife of David Walker� Ozar'kin XI (Summer 1989): 71-72. �Too Many Parents: Camelia (Clark) (McMinn) (Ross) Pope of Polk and Cedar Counties, Missouri,� The American Genealogist 78 (January 2003): 42� 54. �Was Elizabeth, Wife of Richard1 Cutter of Cambridge, Massachusetts, a Daughter of Robert1 Williams of Roxbury?� The American Genealogist 74 (October 1999):292�298. �White Claims for Indian Depredations: Illinois�Missouri�Arkansas Frontier 1804�32,� National Genealogical Society Quarterly 84 (December 1996): 275�304. �Seeking Solutions� Regular Column for Ozar'Kin 1992-1996.